Look familiar? Actually, Didi Gregorius' defense is already earning praise Derek Jeter's never received. I walked into the Yankees’ spring complex with no preconceived notions about what I wanted to write. I walked out stunned by the team’s excitement over Derek Jeter’s replacement, shortstop Didi Gregorius. So, let’s take a day off from talking about Alex Rodriguez’s comeback, the Yankees’ MRI-in-waiting rotation, and the various other questions surrounding this club. The enthusiasm for Gregorius, 25, is genuine — and yes, the contrast between him and Jeter is startling, considering that “The Captain,” according to advanced metrics, rated as a poor defender for more than a decade. Keep in mind that Teixeira is a 12-year veteran, and was teammates in Texas with Rodriguez in 2003 when A-Rod was still one of the top defensive shortstops in the game. I had to ask Rodriguez if he shared Teixeira’s opinion on Gregorius, whom the Yankees acquired from the Diamondbacks last Dec. 5 in a three-team deal in which they sent right-hander Shane Greene to the Tigers. Say what you want about A-Rod, but few players match his passion and knowledge for the game. He even talks in scouting shorthand, using single digits (2 to 8) when referring to the 20-to-80 scouting scale, in which 50 is considered major-league average. And then A-Rod broke down Gregorius like a scout. “What you see in a lot of young players are 6 or 7 arms, but then their accuracy is 3 or 4. Which is normal, par for the course. As they get older, they go from a 7-1/2 arm to about a 5-1/2 or 6-1/2 and their accuracy goes to about 6. But when you have that combination at 25 years old of crazy range, 7-plus arm, 7-plus accuracy … even Ozzie [Smith], he had 7 accuracy but he didn’t have 7 arm strength. Alex Rodriguez appeared in only 44 games in 2013 and none last season, when he was suspended for using performance-enhancing drugs. In one sense, he barely recognizes what baseball has become. “The shift has changed the game even in the time I’ve been gone, the 18 months, whatever it’s been,” Rodriguez said Wednesday. “It’s a different game than when I left. “Eighteen months, I feel like I’ve been gone for five years, 10 years. The game is very resistant to change. Now it’s like, holy smokes. You spend so much time with analytics. I’m enjoying it. Manager Joe Girardi said Gregorius’ range will not change the way the Yankees use defensive shifts, explaining, “We’ll still shift. We’ll still go according to the charts.” But Jeter’s retirement already has led to one subtle adjustment — third baseman Chase Headley said he now would shift only to shortstop and not to second base. Headley went to the other side of the diamond after joining the club last July 22 because Jeter preferred to stay on the left side of the infield. Rodriguez, who will serve mostly as a DH while occasionally playing third base and possibly first, said that the Yankees, even when shifted, can still exploit the range of their four starting infielders, the other being second baseman Stephen Drew. “The spacing is different — it’s almost like when you have a basketball zone,” Rodriguez said. “If you have five great athletes, you can spread it out, cover a lot more than 94 feet on the basketball court. Rob Thomson, the Yankees’ bench coach, said that Gregorius “really gets off the ball,” meaning that he excels at reading bat angles and hops. Thomson also praised Gregorius’ “quiet glove action,” noting that while some infielders will flip their gloves downward to make a play, Gregorius carries his glove outside his left knee and smoothly positions it in the spot where the ball arrives, almost as if he is laying it down gently. One scout following the Yankees cracked that Gregorius is the team’s best defensive shortstop since “Crosetti and Rizzuto” – Frankie Crosetti, who played from 1932 to ’48, and Hall of Famer Phil Rizzuto, who played from ’41 to ’56. Two questions remain: Will Gregorius, a left-handed hitter, improve upon his .680 OPS in 724 career plate appearances, which includes a .490 OPS against left-handed pitching? 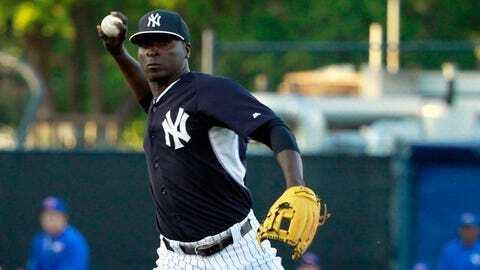 And, how will Gregorius handle the pressure of replacing Jeter? Still, Gregorius is intent upon improving his offense — he’s working to keep his body looser at the plate, not stiffening up the way he did in the past. For what it’s worth, his spring performance — 10 for 35 with three doubles, two triples and two walks — has been encouraging. He’s young, he’s energetic, he’s athletic. I don’t know about the rest of the Yankees, but the new shortstop, at least, will be fun to watch.